Dennis Rupert was inducted as the newest member of the Fulton Lions Club by District Governor Kermit Mott at the club’s April 17 meeting, it was announced by Don Labarge, club president. Rupert is a Fulton native and is the manager at Mimi’s Drive-in, 201 N. 2nd St., Fulton. Lion Gail Holmes was his sponsor. Mott is governor for District 20-Y1 Lions of Central New York, which includes 34 Lions clubs. The Fulton Lions Club, also know for their Lions Loot Sweepstakes and annual Duck Derby, provides financial assistance for those in need of eyeglasses, eye exams and hearing aids to residents in the Greater Fulton area. 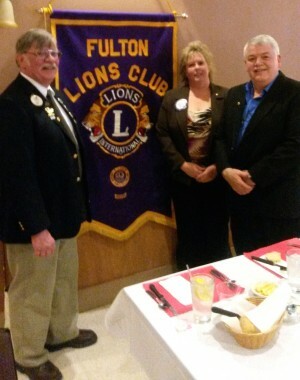 For further information on Fulton Lions, visit www.http://e-clubhouse.org/sites/fultonny/index.php.